“Greater than the Sum of Our Parts” is the intriguing theme of the conference. A few hours in the exhibits gives meaning to the phrase – the exhibitors reflect the diverse and interdependent functions that comprise the complex world of these stewards of the narrative of the nation’s towns, states and regions. The robust agenda includes programs and tours on corporate history, museums, archives, court and legal history, classrooms, interpretive centers, historic homes, military history, religious history and more. The keynote speakers for the conference suggest the diversity of the themes and participants — Garrison Keillor keynoted today followed tomorrow by Marilyn Carlson Nelson, CEO of Carlson and more. Speaker at Friday’s awards banquet is Dr. Anton Treuer, Executive Director of the American Indian Resource Center at Bemidji State University and editor of the Oshkaabewis Native Journal, the only academic journal of the Ojibwe language. The exhibits range from high tech digital archives to art conservationists determined to preserve art and objects as “primary sources”, reflected but not replaced be digital reproductions (or paint-by-number replications) of the original. Squadrons of Minnesota museum mavens, clad in sky blue water t-shirts, are everywhere welcoming the visitors, pointing out the area’s sites and eateries, telling the stories, and having the strength to get up and do what needs to be done to guarantee that the 2014 American Association for State and Local History will go down in history! Librarians tend to get third paragraph thanks in the intro of historic works, or to merit a condescending note in a dissertation, Librarians just don’t get streets named in their honor. And then there’s Marvin Roger Anderson whose name and contributions will gain immortality this weekend. Concordia Avenue between Lexington Parkway and Dale Street in St. Paul, Minnesota, will henceforth be named Marvin Roger Anderson Avenue. In Marvin Anderson fashion, he will share the honor. St. Anthony Avenue between Victoria Street and Western will henceforth by co-named Floyd G. Smaller Jr. Avenue, named in honor of Marvin’s lifetime friend and co-activist. Marvin Anderson is a man of many talents and influence. In his professional world of librarianship he is known as the Minnesota State Law Librarian who opened the doors and expanded the research capabilities of that renowned institution. To young readers he is known as the idea person who built the “Everybody Wins!” reading promotion in the St. Paul Schools. The program got a good start when Marvin inveigled Supreme Court justices to enjoy lunch and a read with early learners at Benjamin Mays School. Though those kids are grown-ups now and the “Supremes” may be retired, the program continues to match caring adults with young readers. The most important consideration of city fathers in naming of the street in his honor is the role of Marvin Roger Anderson as a power in preserving and promoting his home neighborhood, Rondo. Marvin has turned a civic travesty into a celebration of the vitality of his home community. Rondo Days, one of Marvin’s brainchildren, has claimed its place as a major community celebration, complete with a parade, jazz everywhere, and this summer a reunion of the Red Caps who served generations of travelers to and from St. Paul’s Union Depot. Friends and fans of Marvin and his colleague Floyd G. Smaller may want to pull off Interstate 94 to check out the re-christened streets – and pause a moment to recognize the work of Marvin Roger Anderson and Floyd G. Smaller, two men who have collaborated for decades to shine a light on their community and the contributions of the people of Rondo. Marvin Roger Anderson and Floyd G. Smaller will be recognized on the main stage of the Selby Avenue Jazz Fest, Saturday, September 14. Writing about Peter Shea, his quietly amazing projects and his magnificent mind, is no easy task. As my then-young son once observed, Peter is just so “Peter-ish.” Any profile illuminates but a single facet of a multi-faceted man of ideas. September 29, 2010 – Mike Tidwell, author of Bayou Farewell and founder and director of the Chesapeake Climate Action Network. August 30, 2010 – Rob Gilmer, a Ph.D. candidate in the History Department at the University of Minnesota. In the fall of 2010, he will be teaching Oil and Water: The Gulf Oil Spill of 2010, a course which has garnered national attention. August 20, 2010 – Paul Barclay, a professor of History at Lafayette College where his research interests include Japanese empire, especially in Taiwan, frontier studies, and the use of images as historical documents or instruments of ideology. August 15, 2010 – Ann Waltner, a professor in both the Department of History and the Department of Asian Languages and Literatures and director of the Institute for Advanced Study at the University of Minnesota, talks about Matteo Ricci’s 1602 map of the world, recently acquired by the James Ford Bell Library. Though these are the most recent, the full list of interviews over the years is astounding – Eugene McCarthy, John Davis, Rosalie Wahl are among Peter’s favorites. He also mentions Maja Cerar (violinist), Carolyn Walker Bynum (medievalist), Morton Subotnik (composer), Andrew Light (environmental ethicist) and Ann Sharp (educator). The Bat website lists the boundless and boundary-less library of videos Peter has produced since the early days of The Bat when Peter’s two sons (now grown) ran the cameras and, Peter hopes, “got some of the message.” Peter, who allows he’s not much into numbers, produces some impressive ones, e.g. some 82,000 visits to the IAS website and nearly 10,000 video views since Fall 2008. True to form, Peter has plans. One big plan is just unfolding. In a new series entitled Meet the Neighbors Peter, who also works with Shalom Hill Farm near Windom, has begun interviewing members of the rural community for cablecast on community cable then archived in a blog. He’s also been asked by the U of M Department of English to profile all willing faculty – of course he’d like to expand that to other departments. In general, Peter hopes to produce “rich and coherent archives.” He cites, for example, “a fine collection of interviews from the Spark Festival of Electronic Music” and a “small but growing collection of interviews done in connection with the Minnesota Fringe Festival.” One oral history project underway, documentation of the history of the philosophy for children movement. High on the list of Peter’s current enthusiasms is collaboration on expanding access to the lectures from “Oil and Water: The Gulf Oil Spill of 2010” a U of Minnesota course which IAS is providing online through the Bat. Peter’s hopes for a bright technology future include great confidence in the future of cable, primarily because “the standard media have messed up fine productions with commercial interruption and commercial packaging to an extent that seems to me suicidal.” At the same time, equipment is improving and coming down in cost so that “normal people with normal time resources can do interesting niche programming, and the shortcomings will be more than compensated by the lack of commercial distortion and the freshness and immediacy of low to the ground production.” This offers unique possibilities for rural Minnesotans, Peter expects. Other dreams include visions of easy archiving and repackaging, Internet 2, and every viewer both a producer of control of his or her own access options. Learn more about Peter’s background, plans, persona and style by watching an interview archived on the IAS site. You will never keep up with Peter’s fertile mind and high hopes – to keep abreast of the tangible products, watch the Bat of Minerva website or tune in to Channel 6 at midnight on any Saturday or Sunday. Through stage productions, video and countless personal reflections most of us know something about the experiences of the Orphan Train Riders. Beginning in 1854 and continuing until 1929 as many as 200,000 children were put on West-bound trains where they were sent to live – with mixed results – with new families in new homes. The stories of these children, well recorded in numerous reports, are compelling. Their descendents are estimated at over 2,000,000. Thanks to committed individuals including an indefatigable Orphan Train Rider, Sister Justina Bieganek, OSF, the stories of Minnesota’s orphan train children are reflected, recorded and retold with love and care. And each fall Orphan Train Riders and their descendents gather at the St. Francis Center in Little Falls, Minnesota, to remember. Midst hugs, tears, laughs, scrapbooks, performance and good food, the stories unfold in a warm and wonderful celebration of tough times, good times, lives lived and survival. 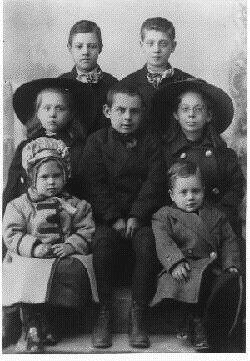 One good story begins in 1913 when a 22 month baby arrived in Avon, Minnesota on the Orphan Train where she was met by John and Mary Bieganet who knew her only as child No 41. The little girl was given the name Edith Peterson. That little girl, now a nonagenarian, picks up the story. “In 1929,” she notes, “two good things happened — the Orphan Train stopped and I entered the Convent.” To be sure, in 1929 the young Edith Peterson joined the Sisters of St. Francis Little Falls where she took the name Sister Justina. Among her many commitments over the past decades Sister Justina has played a key role in keeping the stories of the Orphan Train Riders alive. In July 1861 Minnesota was the first state to carry out a gathering of Orphan Train Riders. It all started when two Orphan Train Riders from North Dakota discovered their common heritage. They decided that “if there are two of us, how many more shells in the ocean can we find?” Starting with an ad in area newspapers, the region’s Orphan Train Riders met, reached out, and created a tradition that continues today with an annual gathering at the Franciscan Center in Little Falls. This year, Sister Justina and her colleagues share the day with special relish. On Saturday, October 2, 2010, families, friends and interested persons (including “interested persons” Suzanne Mahmoodi and me) will gather for the 50th Celebration of Orphan Train Riders of New York (the generic name for the Riders groups). A special feature of this year’s reunion is presentation of The Story of the Orphan Train, a one-woman show created by professional actress Pippa White of One’s Company Productions. Impossible as it is to capture the spirit of the reunion, there are many ways to share the story. Sister Justina herself is profiled in print and has created a 40-minute DVD in which she shares her experience of riding the Orphan Train from New York to central Minnesota. Information about that video is available through the Sisters of St. Francis (info@fslf.org). Among the several websites devoted to the Orphan Train Riders are many that are state-specific, maps, statistics, personal reflections, contacts and more. There is also a great website offering quick links to scores of educational resources and projects. The story of the Orphan Train Riders offers a close and clear reminder of our relatively recent history rich with challenges, choices and consequences. Long-time historian of Minnesota’s Orphan Train Riders Renee Wendinger has created an excellent up-to-date collection of articles by and about the Orphan Train Riders replete with original newspaper clippings, details re. the railroad depots, geograhic distribution and more For a list of Minnesota’s Orphan Train Riders, check here. Many thanks to Sister Justina and to the many Orphan Train Riders and their progeny who tell the stories, whether replete with pain or happy memories, stories so far and yet so near.